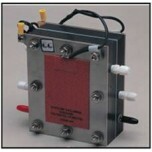 Liquid Electrolyte Fuel Cell are equipped with a reservoir for the continuous supply of liquid fuel (i.e. electrolyte) to electrodes. Since the fuel (electrolyte) is liquid, the solution is soaked in a matrix so that t it can be contained in the fuel cell.